Roughing it does not have to be hard if you have the right dry RV camping accessories. A bit of planning and your vacation should fill you with excitement and not dread. What Is Dry RV Camping? Dry RV camping is when you park somewhere that does not have electrical, sewer, or water hook ups. Sometimes referred to as boon docking or independent camping, dry RV camping can be done in towns or on the open road. Many times dry RVers park in parking lots of large malls, truck stops, and restaurants. This type of camping limits the amount of entertainment you can have outside the RV so if you are staying overnight in a parking lot, be respectful of the establishment and stay in your RV. For open road dry camping or longer stays, you can stay in state parks or established wilderness areas as long as you register with the park ranger first. Bottled water for drinking, washing and brushing your teeth is a necessity. Flashlights or battery operated lanterns to read, play games, or generally see by are important accessories. Bathrooms close by are obviously a necessity. If you are in a parking lot or state park, you can take advantage of the bathroom facilities at those locations. For remote dry RV camping you will need also need the additional accessories listed with the long-term dry camping supplies below. Longer term may be anything from a few days to several weeks. When planning a trip that includes dry camping, make sure you include enough supplies to last the entire trip or know where you can get more quickly. This will prevent inconveniences and make your trip much more enjoyable. Since you won't have a water hook up, you will need to bring enough with you to handle drinking, bathing, cleaning and sewer requirements. Since the typical RV has a water storage area, you should be able to fill that up and have enough water to last several days. If you are going to stay longer, consider buying an extra water storage tank to bring along with you. Otherwise, you will need to travel to an area every few days to get a fresh supply. Keep your drinking water separate from gray and black water so you will have enough in the event you are delayed by weather or activities and can't get into town. Sewer needs are probably the least desirable aspect of planning. Though most RVs are equipped with a bathroom, the assumption of the manufacturers is there will be sewer hook up for disposal. Since you may be in a remote area for an extended period, it is imperative you invest in an additional waste disposal system. There are several methods available with the most common being a portable canister on wheels. It works by hooking up to your sewer lines just like the normal pump station would but instead flows into a multi-gallon storage tank. This allows you to stay put for several more days without having to move your RV. 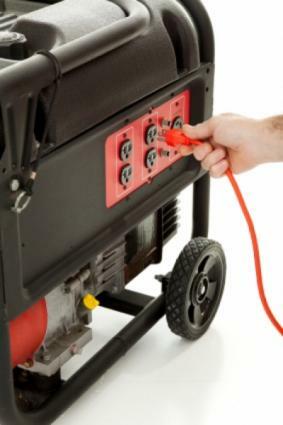 A portable generator is a must for any dry RV camper. The generator can run multiple electronics at the same time and keep the lights and appliances on without needing an electrical hook up. If you plan to dry RV camp long term, you may also want to invest in a solar power generator. This type of generator is more expensive than traditional generators, but will significantly reduce the noise and help reduce the amount of fuel you need to run your traditional generator. Plan your trip around the tourist sites you want to visit. This will allow you to find places in the vicinity to camp and also help you know what dry RV camping accessories you will need. By mapping out each stop on your trip, you can get an idea of where to stay beforehand and not have to scramble at the end of each day to find a place to park.